Nnamdi Kanu walks slowly across the courtyard of his family home in Umuahia, southeast Nigeria, as a crowd of supporters in the red, black and green of the Biafran flag hail him as their saviour. Eighteen months in custody does not appear to have affected his fight against Nigeria. 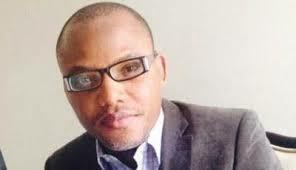 "I am more determined than ever," Kanu, who heads the Indigenous People of Biafra (IPOB) movement, tells AFP calmly. Kanu, who was released on bail at the end of April, still faces trial on treason charges. But there is no question of his remaining silent as a key date approaches on Tuesday: the 50th anniversary of the declaration of an independent Republic of Biafra. The secession of the Igbo people in the southeast sparked a bloody civil war that lasted nearly three years until 1970. More than one million people died of the effects of war, famine and disease. Kanu says his aim is "civil disobedience until we get a referendum (on self-determination)", calling it "the only way forward". After the war, Biafra was reintegrated into Nigeria, an ethnic and religious hotch-potch of nearly 190 million people where sectarian tensions regularly flare. But in "Igboland", the dream of independence never really disappeared, fuelled by a sense that the Nigerian government had abandoned them -- perhaps deliberately -- after the conflict. Veterans and young supporters crowd around in turn to hear the bespectacled Kanu speak. In the living room where he receives guests, a life-size painting covering an entire wall depicts the prodigal son in military uniform. He variously denounces what he says are the "killings" and "rapes" of Igbos by the security forces, and President Muhammadu Buhari's "deliberate policy to impoverish the people". Kanu, who is in his 40s, spent his childhood in Umuahia, which was the former Biafran capital, a stone's throw from the separatist forces' bunker, and was clearly no stranger to politics. He refuses to give his exact age but as the eldest of five children, he grew up from a young age with stories from his father, who gave logistic support to the resistance. Unknown to most Nigerians even two years ago, Kanu had long launched virulent diatribes against Nigeria from London, where he settled after his studies and founded the pirate radio station Radio Biafra in 2009. He worked in real estate and campaigned on the airwaves at night. For a time he was a member of another pro-independence group, the Movement for the Actualisation of the Sovereign State of Biafra. He left MASSOB and founded IPOB in 2013. Two years later at the World Igbo Congress in Los Angeles, Kanu crossed a line with an apparent call to take up arms. "We need guns and we need bullets," he said. He was arrested at his hotel during a visit to Nigeria in October 2015. Fred Anibeze, a Nigerian political scientist, called the arrest "unwarranted and uncalled for". "He is using the Biafra struggle to garner cheap publicity for himself via broadcast from Radio Biafra, and this has been further buttressed with the demi-god persona he has been getting since his release," he told AFP. Kanu's detention caused widespread anger among Igbos, and a series of protests calling for his release ended in bloodshed. According to Amnesty International, Nigerian security forces killed at least 150 IPOB supporters in 2016. Abuja flatly rejects the claim. For Don Okereke, a security analyst, Kanu "embodies aspirations of a new generation, more activist, more radical" than their elders, who fought in the war. "He tells people just what they want to hear," he added. The extent of Kanu's support in the southeast of the country is difficult to gauge but his followers have virtually worshipped him since his release on bail. Kanu does not do anything to stop the myth-making and is protected round the clock by an impressive security detail, who thoroughly search all his visitors. Religion is ever-present in his speeches, and Kanu now wears the talit (Jewish prayer shawl) and observes the sabbath. IPOB followers also wear the kippah (skullcap). 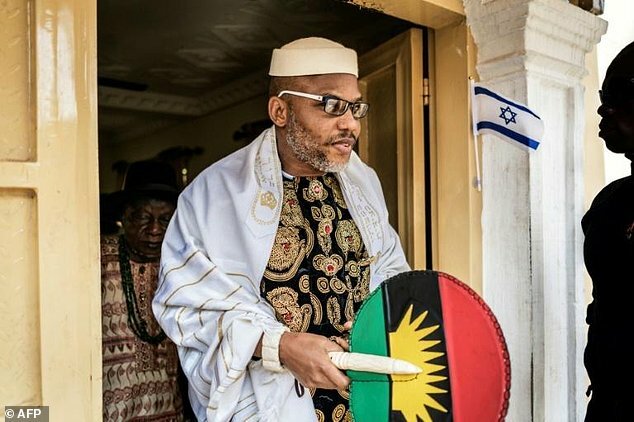 It all dates back to a "divine revelation" Kanu says he had during a trip to Jerusalem: the Igbo -- most of whom are Christian -- are descendents of a lost tribe of Israel, he says. Biafra is the "promised land" and it is his mission to restore it.